Dutch artisit Jan Hendrix is presenting his works "The Qatar Drawings” at the Museum of Spanish Contemporary Engraving (Museo del Grabado Español Contemporáneo de Marbella) starting today until December 11. 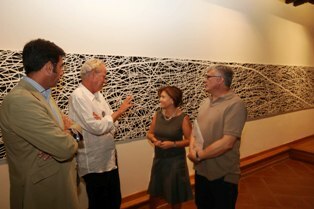 Jan Hendrix has received the International Prize of Contribution and Innovation in Graphic Art of the National Prize of Graphic Art 2008, organized by the National Engraving of the San Fernanado Royal Academy of Art. The pieces that Jan is exhibiting at the museum has its origins in a project that the artist has developed in collaboration with the architect Ricardo Legorreta in the last few years for Education City, in the city of Doha in Qatar. The images of this exhibition present the process of delivering the drawing to a graphic and from there to architecture. The Qatar Drawings exhibition is open to the public until September 18 Wednesday through Friday from 9:00am until 2:00pm and then again from 6:30pm until 11:00pm. On Saturdays it is open only during the morning hours. After September 20th, public opening hours on Mondays will be from 9:00am until 2:00pm, from 9:00am until 9:00pm Wednesday through Friday. Saturdays will be open only during morning hours. The Museum of Spanish Contemporary Engraving is considered the best of its kind in Spain and has a prestigious reputation among the international community.